For those of us who grew up on a steady diet of pop music, the classical canon can sometimes seem like a parallel universe; the music is undoubtedly powerful but the rules and rituals surrounding it are unfamiliar. Centuries of history, a specialized vocabulary, not to mention the sometimes daunting aura of “high culture” can make approaching classical music as a curious listener or musician a somewhat complicated endeavor. This is perhaps even more true for the contemporary classical field, which from a distance seems to be a world that is both highly fragmented and deeply insular. Fortunately, there are a number of young composers emerging today who aim to invent music capable of engaging the intellect and the senses equally, and without adherence to the strict dichotomies that formerly segregated culture into high and low-brow varieties. 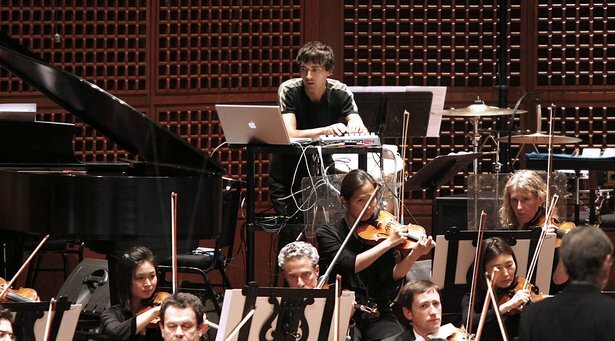 Among the most prominent of this new breed is Mason Bates; the award-winning 37-year old California-based composer frequently augments his orchestral and chamber works with the sounds, rhythms, textures and techniques gleaned through a deep appreciation of techno and electronica. Crucially, the electronic elements in his compositions are never mere ornamentation serving to cheaply ‘modernize’ the orchestra, but are always in meaningful musical interaction with the acoustic instruments. Moreover, his wildly imaginative use of the resources at his disposal is never just an end in itself, but is always in the service of a strong and specific narrative. In this respect, Bates’ music harkens back to development that began with Beethoven – and it is together with good old Ludwig van that he shares the honor of being the San Francisco Symphony Orchestra’s current featured composer. We caught up with Bates in the midst of the yearlong ‘Beethoven and Bates’ festival to talk about his energy symphony, electronics in the orchestra, junkyard percussion and the similarities between DJs and conductors. Your music frequently refers to real places, people and events. What are some of your non-musical influences? Well, it’s funny. Back in the day when I was an English major I didn’t really think studying magical realism or metafiction or post-modern fiction would have a direct impact on my music. I just thought that it was something that I enjoyed reading and it would provide a good basis for my education. Did you have ambitions of becoming a writer? Yeah, I think at one point. I’ve always enjoyed writing words. I think it’s as challenging as writing music. In the end, it wasn’t for me, I didn’t have much to offer on that front, but I found that the imaginative forms that define literature had become really important for me. And in a piece like Alternative Energy that travels through different kinds of stop points in the history of energy, that’s something that came out of reading Cloud Atlas, the book by David Mitchell that became a movie. 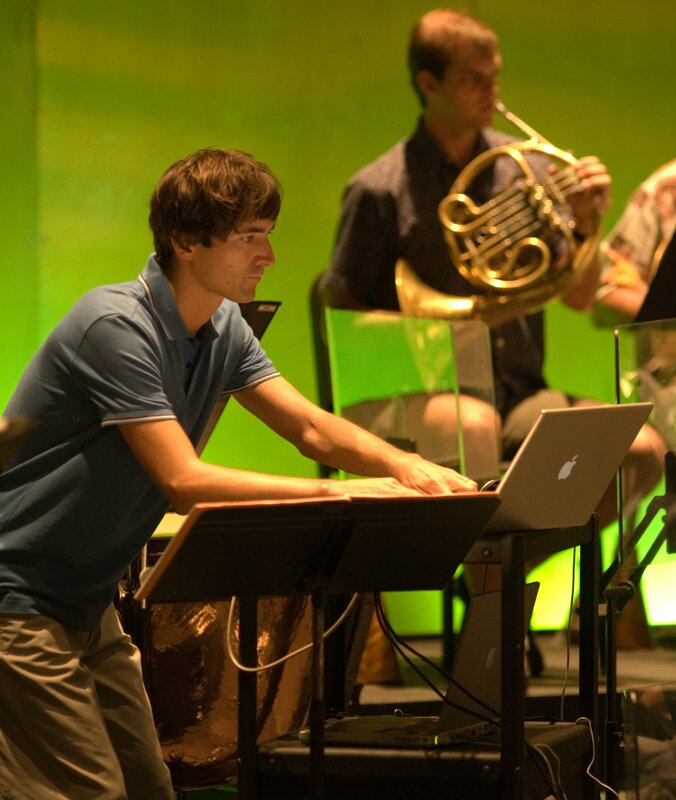 A short excerpt from a rehearsal of Mason Bates’ Alternative Energy. But I guess I find it pretty inspiring to look back a few centuries. You know, in the nineteenth century there were huge programmatic pieces such as Berlioz’ Symphonie Fantastique that would tell really wild kinds of stories. And I found that doing that with twenty-first century language is really inspiring for me. So literature is the primary non-musical influence. Regarding the actual sounds you’re using, you’ve put together a percussion set from junkyard parts for a section of Alternative Energy, is that right? Yeah exactly. There’s this first movement that I wanted to take place on Henry Ford’s farm, this idea of somebody building a car. So I actually went to the junkyard with the percussionist of the Chicago Symphony and found all these pieces of junk – there’s actually a fairly storied history to that in music, be it Einsturzende Neubauten or George Gershwin, even he had car horns. So even when it’s acoustic I think there’s a lot you can do with percussion instruments. I have a piece called The B Sides that at different points has a broom, an oil drum and a typewriter. So I find that it’s not just the actual sound but there’s a little bit of theater that you get from the percussion ensemble. A performance of The B Sides by the Detroit Symphony Orchestra with Mason Bates. This brings to mind the Musique Concrète idea of taking the sounds from the world around us and using them musically. Do you feel any affinity with that movement? Yeah, I mean I think it’s absolutely something that I’ve thought about and it’s interesting whe recorded sound has a kind of content to it. You know, even in Matmos’ A Chance To Cut Is A Chance To Cure, when you start to realize those sounds are all taken from surgical procedures, it really colors your perception of it. Working with an orchestra through the conduit of a conductor, is there a strict divisio of labor where the conductor takes over after you’ve finished with the work of composing? Or is there some element of collaboration? You know it’s interesting. I think to this day I still have a tough time understanding the chemistry that happens between a conductor and the orchestra but it’s ever more clear to me that it’s something that makes 100% of a difference. It’s a special thing with my music and the electronics, what relationship the conductor will have with that element because that’s something that’s new to everybody who encounters it unless they’ve played another piece of mine, so that’s always special for me. You know the orchestra is kind of like an ocean liner, like it cannot just turn on a dime. And there are moments when you’re sitting there and you’re locked playing together and you start to realize that the orchestra is shifting and it’s a very weird thing. Yeah exactly. So the tempo warping with Ableton has been critical... because when I’m performing I can use the nudge tempo and bend tempo functions to keep the enterprise together. You know when I’m using that with an orchestra there’s really no margin of error. Like you cannot have the thing crash, you can’t have it be a tap tempo that doesn’t work. So that’s be phenomenal for me in having that provide more fluidity, more flexibility. 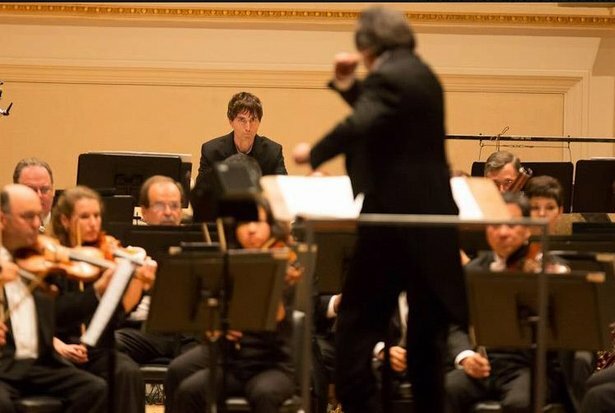 Mason Bates at Carnegie Hall with conductor Riccardo Multi. Let’s talk about your compositional process. For many people who use software like Live, composing actually means composing and arranging sounds simultaneously. Is that similar to the way you compose or should we be imagining you as a man at a piano with sheet music, writing it all down note by note and bar by bar? You know, I think in the best case scenario there are a multiplicity of approaches. The great thing about my experience with electronic music is that it really has impacted my workflow. So a lot of times if I have a piece with electronics it’s impossible for me to just add the electronics later, I have to integrate that into my approach. So for me the approach generally is to start without my hands on anything. I usually try to think about what the piece is going to be, whether it’s going to be a water symphony like Liquid Interface was, or this Anthology of Fantastic Zoology which comes from a book. Then there’s working at the piano, working at the computer trying to find the material that brings it to life. And you know, often the digital processes that we’re all familiar with now bring a lot of interesting solutions to the symphonic world. You just have to be careful because it can be very tempting to work entirely as a cut and paste artist – but that can have some drawbacks when you’re dealing with, you know, 100 people on the stage playing a certain way. Is there some ideal balance between the electronic and orchestral parts that you strive for? For it to stay interesting for me and for the people that hear the pieces, I think the electronics and the orchestral sounds have to kind of be evolving in the relationship. You know when I first started putting electronic sounds with orchestra, it was almost entirely just like pops and clicks and electronics with straight up symphonic sounds. Then I got really interested in naturalistic sounds, be it glaciers or earthquake recordings. More recently I’ve gotten interested in themes of technology, be it particle accelerators or whatever. But the relationship always needs to change and one thing that you have to deal with when you’re trying to integrate electronics and the orchestra is: what is the relationship between the symphonic sound and the textures coming out of the speakers? And you always ideally want to have it so that they integrate in such a close way that you can’t really imagine them pulled apart – so I’m always trying to find ways that the orchestra can sort of enter that electronic space and come out of it. It might even be that the orchestra sounds kind of electronic. A performance of Bates’ Mothership by the UBC Symphonic Wind Ensemble. I want to just zoom out and get your take on a historical thing that I’m interested in. The use of electronics in art music now has something like a 50, 60 year history. And these days, our ears are very accustomed to hearing synthetic and electronic sounds – it’s been part of mainstream pop music at least since hip hop, at least since the 80s. My question is, in the world of symphonic music, do electronic sounds still feel fresh? Do they still have the capacity to shock? It is still a big deal in the symphonic field, primarily because nobody’s really done it. I mean you’ve had like you said a 50 or 60 year history of electro-acoustic music. Almost all of that was chamber music, like Synchronisms by Davidovsky or something by Milton Babbitt or Stockhausen. Nobody really did much with large ensembles like the orchestra. And if you look at the symphonic canon, not even just what’s heard at a regular concert but at a concert that has lots of new music, there are never any electronics sounds. There have been many aesthetic, logistical, and technological challenges to making that happen. So it is still new and, I think, quite revolutionary for people in that space to hear something as seemingly established as the orchestra work with electronic sounds. That said, for me the electronic sounds are really just a means to an end. I certainly appreciate that people are excited about the fact that there’s kind of a new section in my pieces. But in a piece like Alternative Energy, it’s just one section out of four or five. In fact electronics don’t even enter into that piece until minute eight or nine, albeit in a very big way. I guess what I’m saying is that for me, even though it is obviously exciting to work with something that is new in this symphonic space, it can’t really be just there for the novelty value. Mason Bates during a performance of Alternative Energy yt the Cabrillo Festival of Contemporary Music. The current season at the San Francisco Symphony is entitled Beethoven and Bates. How did that come about? Well the San Francisco Symphony under Michael Tilson Thomas has always done really provocative and interesting programs. Like I remember the opening of the season two or three years ago had Ligeti’s Lontano which is almost like an inverted photograph of what you would expect to be a concert opener. You know instead of being fast and loud it’s completely clustery and weird. So Michael’s always been very provocative on that front. I think that what he felt my music would bring to his focus on Beethoven was a kind of fairly bold embrace of a new kind of language but in a way that certainly has historical roots. You know, I’m not writing like a blend of pink and white noise while the orchestra plays clusters. I definitely love the things that an orchestra can do tonally as well as atonally. Well if you look at the 9th Symphony, you know when the chorus comes in, that was the first time that a symphony had content. Before that, symphonic movements were fairly divided. Already in the fifth symphony Beethoven was kind of breaking down the movement divisions almost like Pink Floyd did with the song unit in their concept albums. So he was really the beginning of that programmatic approach in the nineteenth century, and subsequent programmatic composers like Berlioz and Wagner would look back to the 9th as the genesis of this. In my music, the electronics not only offer techno rhythms, but more importantly they offer a narrative approach – ie, you're standing next to a melting glacier, or you're inside a spinning particle accelerator. See and hear more from Mason Bates.